Last week we were shown a hands-off presentation of The Witcher 3. It’s the same section of the game that was shown to journalists at E3 back in June. After seeing The Witcher 3 I have a suspicion it’s something special. 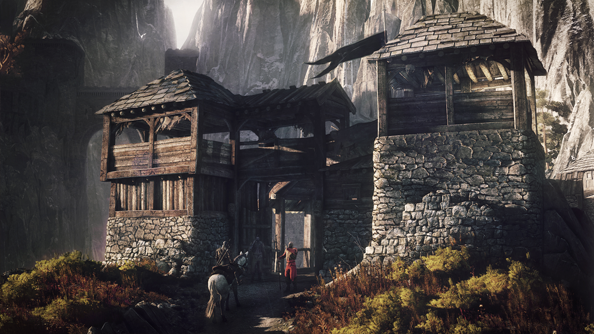 It’s much more than a prettier looking, more open version of The Witcher 2. It looks like a game by developers who finally have the experience and resources to make what they’ve always wanted: an open world RPG, full of choices with no right answers, the consequences of which can be brutal and far reaching. It also has exploding crows. 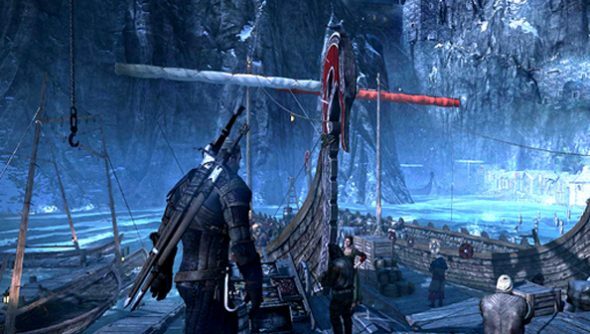 Early in the presentation Geralt is walking through a cliff-hugging port town. It’s dotted with stern looking buildings that can stand against tall waves and strong winds. Around you groups of rough looking fishermen talk of their catch, a butcher chops meat under an awning in front of his shop, and galleys docked along the seawall rise and fall with each swell. As you take to sea in a small sailboat you pass galleys where sailors chant in time with their oar strokes. The details aren’t complex but because they’re so well handled the world feels lived in. Skyrim’s NPCs are stilted things that prevent me from being sucked into that world. When I get hands on with The Witcher I’ll be spending my time walking about the town searching out all CD Projekt’s deft touches. Everywhere you go you stumble across something to hold your attention. Our guide mounted the hill to discover an eight-foot tall monstrosity that looked like a hairless, antlered bear. It looked up from its lunch – two recently-deceased campers – and charged us. It wasn’t part of a quest, it was simply in the world to be found. The creature could turn bright day into pitch black night and used the darkness to get behind Geralt. With only a tiny circle of light surrounding Geralt’s feet he had only a second to dodge the fiend’s charges. It looked spectacular. After a couple of deep slashes to its chest with Geralt’s sword, the monster used its day to night spell to run away. We were told that we could track the beast to its lair and kill it for a bounty. For what feels like the first time for the series, you are not constrained by the story but actually working as the monster-hunter Geralt is supposed to be. You explore the world, you hunt monsters, and you’re paid for it. You won’t just stumble across monsters. Minor quests that won’t start a long chain but can be over in minutes can be found all over the islands you’re exploring. We saved some folk from bandits who were trying to break into their home. They thanked us and we were on our way. Even these small quests have consequence. If you return to that shack later in the game you’ll find a burnt out ruin: a bandit reprisal for your violence. The Witcher 3 isn’t all random, open world happenings. CD Projekt claim it will take a hundred hours to complete the game, a good part of that will be structured quests. A particular quest took up the bulk of our presentation. Geralt has travelled to a remote village to meet with the lone survivor of a recently ransacked hamlet. The man claims it was destroyed by The Wild Hunt, a group of Elven slavers that Geralt’s been hearing about since the first game and is finally free to track. That’s as much of the main quest as we were shown. CD Projekt instead showed us just how much work has gone into their optional sidequests. We spent forty minutes on something that a player can choose to ignore. Immediately after the survivor tells us what direction The Wild Hunt were headed a villager runs up, telling us about a corpse on the fringe of the forest bordering the village. The body’s a grim sight. Roots have grown through it, piercing it with thick tree limbs. Two villagers come forward. Harald, an elder, tells you that a forest spirit is responsible. It’s been angered by hunters using unnatural methods – gunpowder and traps – in its woods. If the hunters were to return to using bows and blades then it would be pacified. The other, Sven, claims that the spirit has always killed hunters and must now be banished. He asks you to investigate and solve the problem. Both men are offer options to solve the problem but our guide chooses to work with Sven. Before Geralt can kill the spirit he has to find out what it is. 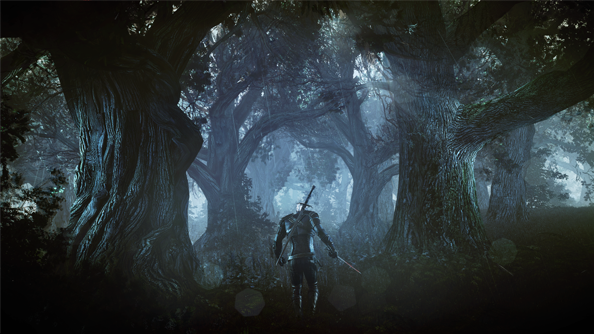 Our guide uses Geralt’s heightened Witcher senses to search the Forest for clues. We’re told investigation is going to take a more active role in The Witcher 3 than it has in previous games. Like the medallion in The Witcher 2, Geralt’s keen eyes and ears highlight things in the world that we wouldn’t normally see. Trails of blood stand out against a monochrome world. We can hear the sound of crows clearly in an otherwise muffled soundscape. Both are key to finding out what we’re actually dealing with. 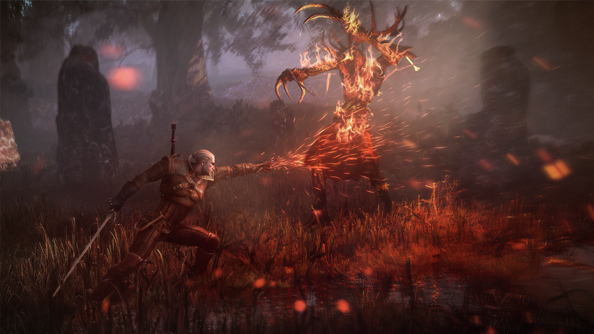 As Geralt finds a Blair Witch-style totem of sticks strapped together with vine he twigs that the creature isn’t a spirit but something called a leshen. Geralt can’t just kill a leshen easily. We learn when consulting Geralt’s bestiary that the ancient beastie will have marked one of the villagers as its ward. If it dies it would use their body to come back to life. 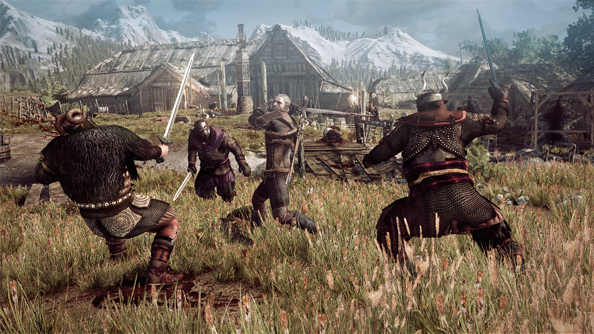 Again, using Geralt’s Witcher senses we find a villager surrounded by crows – a sign of the leshsen. The ward is Hilde, Sven’s squeeze. Geralt manages to convince him that he must kill her so he can kill the leshen. Geralt enters the forest and begins torching the leshen’s totems. Crows pour out of the idols and explode into sparks and flame as they hit Geralt’s ignis spell. The RED Engine really is damn impressive to see in action. 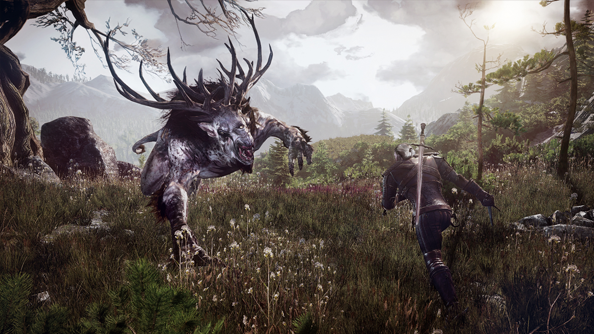 Soon the the leshen claws out of the ground to face you. Packs of wolves leap out from between its tree limb legs and it tries to run you through with roots that shoot out from the ground. Spectacle aside, it’s a pretty standard boss battle. You learn the leshen’s attack pattern. Dodge the roots, kill the wolves, stab the leshen. While looking great graphically, fighting monsters in the Witcher games still looks to be less entertaining than fighting other humans. Fighting with Geralt’s sword is always more fun when you’re countering sword swings and blocking swings from opponents all around you. The village is in turmoil when you return. Sven and his men have killed Hilde. They’ve also killed all the village elders. He’s installed himself as the village’s new leader and threatens to cut down anyone who opposes him. He couldn’t have done it without you. Our guide chooses to ignore Sven’s actions and just leaves. After taking the money for dispatching the leshen, of course. It’s clear that events could have gone in a number of different ways. 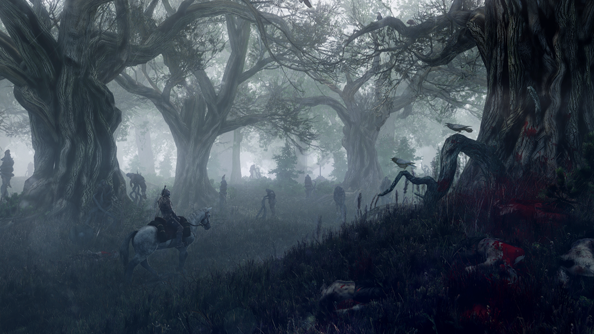 We could have helped Harald and tried to find a peaceful way to stop the leshen’s attacks. Though that, too, might have ended with the monster’s death. It might have meant Harald and the elder’s survived though. It wasn’t clear but we might have been unable to convince Sven to kill Hilde if we had chosen other conversation options. In that case we may have to murder her ourselves or kill the leshen twice, once in the woods and once when it comes back to life in the village. Either way, we might have had to kill Sven. An epilogue video tells us that three months after Geralt leaves Sven’s village it’s razed to the ground by barbarians. It’s suggested that if we’d left the leshen alive it could have saved the villagers. It’s a crude way of conveying the consequences of your actions: CD Projekt don’t have the time span within the game to show you the village’s destruction so they opt for a video instead. That aside, the work the developer is doing to show that Geralt doesn’t simply walk through his world but changes it wherever he goes excites me. CD Projekt aren’t tying themselves to providing incentives for their consequences, they’re just showing you that the world is changing. Other open world RPGs are shallow because your decisions are bound to reward incentives. Fallout 3’s Megaton quest had you decide between destroying an entire town of people or leaving them be by offering you two different houses, one in the town or one outside it. You couldn’t even use the houses for anything worthwhile. The Witcher 3’s world isn’t about turning Geralt into a landowner and giving him a wardrobe filled with cosmetic rewards. It’s presenting a world in which your decisions can mean the death of an entire village and you’ve not made that decision to get a shack, you made it because it seemed like the right thing to do. We could have ignored the quest altogether. Perhaps we should have. Geralt isn’t always the hero in other people’s stories. Check ourWitcher 3: Wild Hunt PC reviewand see where it ranks in our list of thetop PC RPGs.